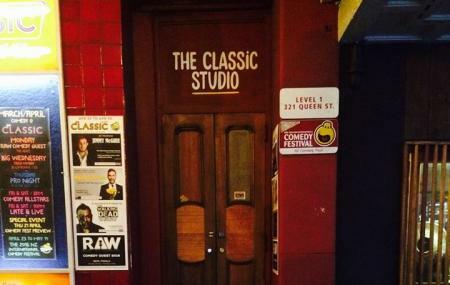 The Classic is a live comedy venue in the heart of Auckland. It is New Zealand's first one of its kind venue. It is open up to 6 nights a week featuring local and international guest comedians in a 140 seated cabaret style setting. The original design and layout of the Classic is based on some of the most successful clubs in the USA and the UK, so not surprisingly, many of the international acts that have played. Buffet Dinner and Show Package costs start from $62 onwards. Express Dinner and Show Package costs start from $50 onwards. How popular is The Classic? People normally club together Aotea Square and Carlton while planning their visit to The Classic. People also prefer to end their day with The Classic. Some bright Talent at 'Classic Comedy'... I was quite entertained. It is always nice see and hear a bit of witty humor. Each comedian seemed to involve you in their own way. Quite a broad span of humor from dark, sick, to light and subtle. It would not be extraordinary to make this spot a consistent visit. Check it out! Just fantastic! Even on a Monday night open mic session it was fanastic. So good to see such talent at the grass roots. Will be back! Fun staff and experience. I feel the inside could do with an update. But otherwise great! Still going after all these years. A good, honest venue. Andrew Clay is a superb MC and still one of the funniest New Zealander's ever and worthy of 10 stars. The admin side of the Club need to be a little more onto it - customers and their $$$ keep you in business don't forget. Answer your phone messages and respond to emails in a timely fashion. The bathrooms appear original :-/ A good night out. We got a great show tonight. $15 for the late show, got an awesome lineup and an awesome crowd - really nailed it. Nice one!